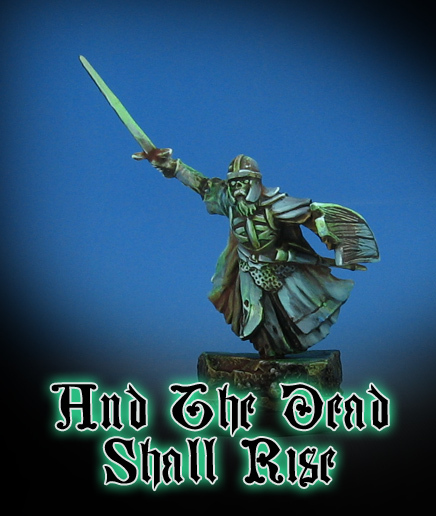 This Lord of the Rings Army of the Dead figure was a fun exercise in the combination of glowing fluorescent paints and weathering! In an attempt to mimick the effects that you see in the movies, I had to convey a sense of decay, but also an ethereal glow. That glow is easy enough to establish when mixing the high chroma fluorescent paints, but 'weathering' them like a tank is another prospect all together. I used my normal combination of Secret Weapon rust paints with the Vallejo Flesh wash. This created the "sedimentation" effect that you have heard me mention several times. This sedimentation will settle exactly where I need it... down into the crevices. However, since it is more of a wash, the bright glow of the original fluorescent paints is not completely lost!